If you live in the northern hemisphere —and statistically speaking, there’s a 90% chance you do — then go outside and look south as soon as the sky gets dark. You’ll see Orion standing tall to the southwest, leaning a bit to his left (your right, since we assume he’s facing us), with the bright star Sirius to the lower left, and Procyon directly left of reddish Betelegeuse (Orion’s right shoulder – to your left). Just above Procyon are two more bright stars, close together in the sky. These are Castor and Pollux, and they mark the heads of the twin brothers denoted by the constellation Gemini. If you have good eyesight you may be able to tell that Pollux (the one closer to the eastern horizon) is yellowish, while Castor is blue. Rogelio is a phenomenally gifted astrophotographer (if you’ve read my blog for any length of time you’ve seen his work, and his “Orion from Head to Toe” is one of, if not the, best wide-field astrophotos I’ve ever seen), and he took this shot in a single night! He has two FSQ106 telescopes aligned to look at the same section of the sky; one takes a “luminance” image (across all the visible colors, to get faint details) while the other shoots using three filters — red, green, and blue — to capture the color information. He used multiple five-minute exposures for a total of three hours of imaging, and the final mosaic here is a combination of three panes (positions in the sky). The two stars are about 4.5° apart in the sky (the Moon is about 0.5° across for comparison). Now, many times, two stars can be apparently close in the sky, but very far apart in 3D space. For example, although they’re not too far apart by eye, Sirius is about 9 light years away, while Rigel is over 850 light years distant! Rigel is extremely luminous, which is why it looks so bright even though it’s far away. Castor and Pollux, though, actually are relatively close in space, too. Castor is about 50 light years from Earth, and Pollux about 34, so really they’re only about 15 light years from each other. Given that they look about the same brightness, this is a clear sign that Castor is actually the more luminous, the more intrinsically bright, of the two. Despite representing twins, they’re very different stars. Pollux is classified as a K0 III star. The K0 means it’s cooler than the Sun, at a temperature of about 4400° Celsius (the Sun is about 5500°). The III means it’s a giant, though, a star nearing the end of its life. It long ago used up the hydrogen fuel in its core, and is now fusing helium into carbon. That’s caused it to swell up, and it has a diameter about 9 times the Sun’s. Castor is a bit more… complicated. It’s not really one star: It’s six! Or really, three pairs of binary stars. Now, follow along here, because it gets messy: Through a telescope, Castor resolves into two stars, both A-types, hotter and with about twice the mass of the Sun. Castor A is about twice as bright as Castor B, and they orbit around each other once every 445 years. But, each of those stars in turn is also orbited closer in by a dwarf red star. So, now, we have Castor Aa and Ab (the brighter star and its companion) and Castor Ba and Bb. Castor Ab and Bb are too faint and close to their brighter companions to see individually, and instead reveal their presence by tugging on their parents as they orbit. That tug invokes a Doppler shift that can be seen in spectra. But it turns out another binary orbits outside both of the binaries making up Castor A and B! That’s Castor Ca and Cb, a pair of much fainter M-type red dwarfs. Each has about 0.6 times the Sun’s mass, and orbit each other once every 20 hours (so they are a very tight binary). It’s not clear how long they take to orbit Castor A and B, but they may have a period well over 10,000 years. Though Rogelio’s image can easily see stars as faint as Castor C, that binary is so close to the main stars of Castor (about 5 pixels in Rogelio’s original full-res image) that they’re lost in the glare. Coincidentally, Pollux started off life as an A-type star as well, much like Castor Aa and Ba. Some day, when those stars run out of hydrogen in their cores, they’ll swell up and turn yellowish-red like Pollux, too. They both may get big enough to swallow their companion red dwarfs, though, with Castor Aa, it’s iffy (its companion is about 16 million kilometers away, and Castor Aa may not get quite that big). When that happens, they’ll get much more luminous, easily outshining Pollux. Which brings me to one last weird thing. Typically, the brightest star in a constellation is given the designation Alpha, and the second brightest Beta. 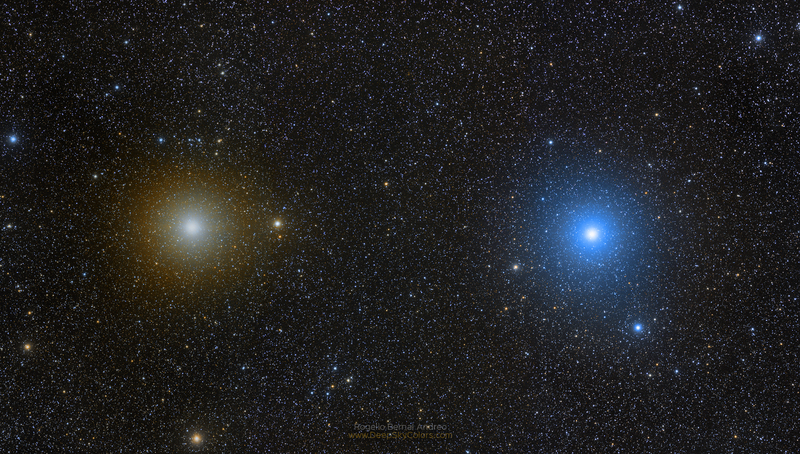 But while Pollux is brighter than Castor, it’s given the Beta designation, while Castor gets Alpha. It’s not clear why that happened; it may be that Pollux has dimmed since it was catalogued by the astronomer Johannes Bayer in the early 17th century. He also sometimes gave the Alpha name to the fainter of two stars if it rose earlier, which is confusing. Nowadays, our cataloguing systems are a lot more consistent, but we still use the historic names for bright stars and other objects. Habit. Anyway, if you get a chance over the next few weeks, I urge you to go outside and take a look. That whole area of the sky from Gemini to Orion is magnificent, and if you have a good pair of binoculars, just sweeping over it will reward you with countless stars, clusters, and nebulae. And remember: each of them has a story, just like Castor and Pollux do. The sky is filled with amazing tales. You just have to listen.